SITKA — On Jan. 14, more than 200 people crowded inside the oldest ANB Hall in Alaska to partake in a koo.éex’. Koo.éex’ is Tlingit for “to invite to a feast;” it’s commonly called a potlatch. Typically, these ceremonies are held to commemorate the loss of a family member, thank members of the opposite moiety for the support they gave during the grieving process, and then collectively put that grief away. There are gifts, songs, dances, and wild foods — often, herring eggs among them. This koo.éex’ however, was different. Herring eggs, gaax’w, were not just on the plates. They were on the minds of all in attendance. The Herring Rock Water Protectors are a group of activists and friends who orchestrated this koo.éex’ to build strength and will to conserve Sitka’s herring, as well as to honor it. While less common today, similar ceremonies were held by the Tlingit to create law, consecrate relationships, share responsibility and pass on oral history. The Herring Rock Water Protectors timed this koo.éex’ to align with the Board of Fisheries meetings currently being held in Sitka. They invited the seven members of the board, who will be hearing proposals and making decisions that impact fisheries, including the sac-roe herring fishery. Four members attended the koo.éex’ to learn more about the Kiks.ádi and their relationship to Sitka’s herring. Before the koo.éex’ and the Herring Rock Water Protectors, there was Standing Rock. “Our hearts were breaking (in response to Standing Rock). It wasn’t historical trauma, it was current trauma,” remembered Lakota Harden. Harden grew up on Japonski Island in Sitka, as well as in South Dakota. She is Lakota and many of her family members, including her mother’s sisters, were in leadership roles at Standing Rock. Lakota Harden and Louise Brady are two of the founders of the Herring Rock Water Protectors. “Some of the things we saw happening and what is still happening, we all lived it, on a smaller level, in this town: how we are not taken seriously, that we are seen as something less than human and had to grow up that way and knowing that and seeing how it affected our parents and grandparents. We also saw how our parents fought against that and fought for what was real and instilled that in us,” said Harden. Doing nothing about Standing Rock was not an option. “There is this feeling sometimes of despair and hopelessness. Why haven’t things changed in 30 years? In 100 years? In 200 years? In order for me to stay sane I have to do something,” said Brady. The two held an impromptu gathering at Totem Park. And in the weeks that followed, more concerned Sitkans came forward and began organizing. Some of those groups combined efforts and held the Sitka Stands with Standing Rock event in November of 2016. “I think there never actually was a transition to herring; I don’t remember a stage in this group when herring wasn’t on our minds,” said Matthew Jackson. Matthew Jackson and Elsa Sebastian are two of the group’s core members. Both, born and raised in Ketchikan and Point Baker respectively, learned about their hometowns’ once abundant herring seasons through books. When they put down roots in Sitka and experienced the spawn first-hand, they were moved. For Brady, the call to protect herring was an obligation. “I am Kiks.ádi from the Point House, grandchild of the Kaagwantan, and us Kiks.ádi women are known as the herring ladies,” explained Brady. Each spring, the Kiks.ádi clan commemorates the start of the herring spawn at T’eyyi, the Herring Rock, where the herring first came to spawn in Sitka Sound. Water is poured over the rock, blessing the onset of the season. Storytellers relate the herring lady story, which stresses the clan’s spiritual and communal relationship with herring. “This is about honoring our ancestors and honoring everything around us that we have a special relationship to. Because we have the Herring Rock and the Herring Lady, we have that obligation and it didn’t come to us by chance,” said Brady. Herring season on Sitka Sound is remarkable. The quiet coves foam. The water erupts turquoise with the milt and eggs from schools of shimmering fish. The Sound becomes a boiling, seething feast for whales, seals, and eagles. People collect kelp and hair seaweed coated in eggs or lay hemlock branches into the spawn. 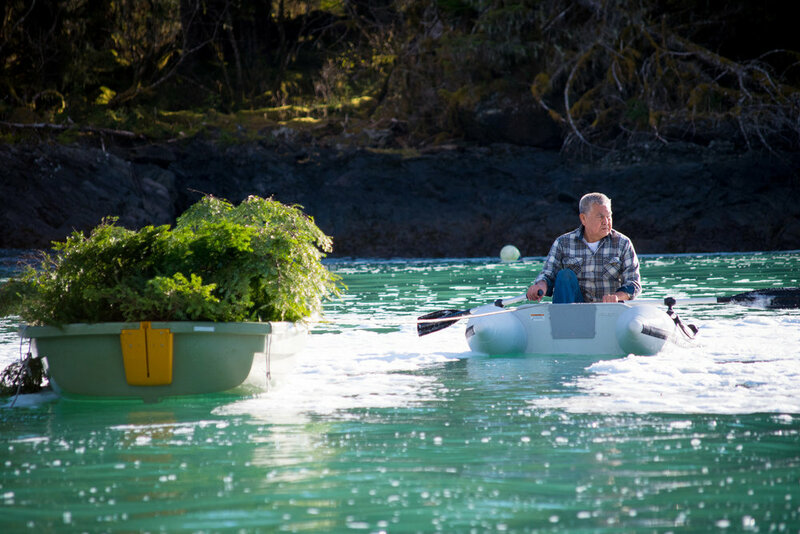 Sitka is the final stronghold for Southeast Alaska’s herring, the epicenter for a revered and once abundant staple food from the Gulf of Alaska to the Bering Sea. The reduction fisheries that churned the region’s herring into oil from 1882-1966 put heavy pressure on Southeast herring populations. Reported harvests range from a peak harvest in 1929 of nearly 80,000 tons to a collapse and complete closure of all commercial herring fishing, except for bait, 12 years later. Today, spawns outside of Sitka are scarce and occur in small pockets. In response, STA submitted three proposals to the Board of Fish that would limit allowable commercial quota and increase off-limits area to the commercial fishery. The Herring Rock Water Protectors rallied behind these proposals. Earlier in January, Sitka’s City Assembly supported STA’s proposals (4-2) and Sitka’s Fish and Game Advisory Committee also voiced support for conservative changes to management. What’s at stake? To members of the Herring Rock Water Protectors, it’s hard to put into words. “It’s like living without water. You have to have water. You enjoy that drink of water. You get quenched by water. That is herring. That is herring eggs. That is the experience. It is something that you can’t imagine living without, how sacred and how precious it is,” said Harden. When Brady suggested hosting a koo.éex’ open to the public and the Board of Fish and timed with the Board of Fish meetings, the group went to work preparing gifts, crafting invites, learning dances and sourcing hundreds of pounds of wild foods to share. “I think there has been such a separation, a Native and the non-Native community, and we also know there is the Filipino community and others but I’m hopeful that this koo.éex’ might be a way to learn from each other,” Brady said. The last time the Board of Fish meeting was held in Sitka was in 1997. Then, too, Brady, her sister and mother, STA and a group of tribal elders organized. During public testimony, a set of three lights warn participants when their strict 3-minute time allotment is up. “And he’s talking and he’s passionate and then, the red light goes off. And the Board of Fish says, ‘Thank you for your testimony.’ And, he keeps on talking. ‘Excuse me, your time is up,’ to this precious, precious elder. And I was upset. Even now, my heart is going. I went to the other people I organized with and said ‘I don’t know if I want another one of our elders to be treated like this. We don’t treat people like this’,” said Brady. Twenty years later, many of the people who testified that day, including Jacobs Jr. and Brady’s mother and sister, have passed on. But its memory helped spur Brady to plan the koo.éex’ and the Herring Rock Water Protectors’actions. “I’m really hoping that we can help people see that your voice matters and you deserve to be respected. Your knowledge that dates back thousands of years, your voice and your ancestor’s voice that have been heard on this land for thousands of years, you deserve to be heard. You deserve to have a say in this situation where we may lose, we are losing, we have lost so much. This is ours, this is our responsibility not only as Kiks.ádi women but as Kiks.ádi clan and as Tlingit people,” she said before the vote. 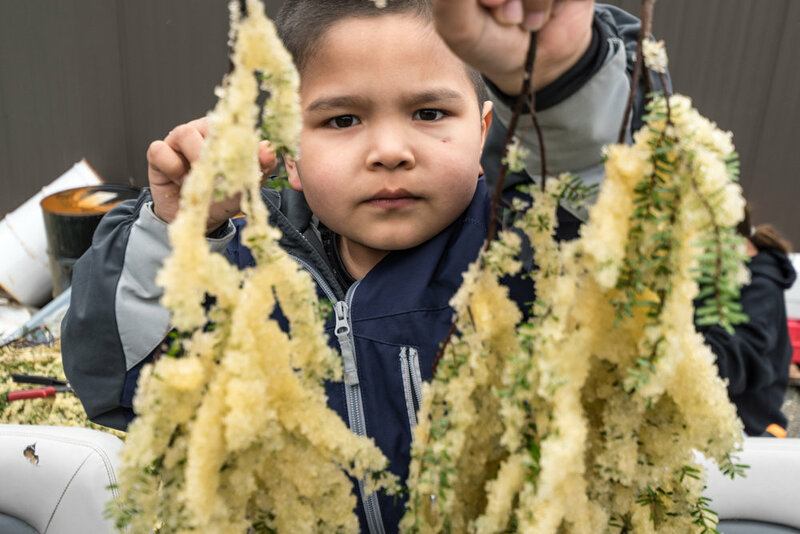 “I hope that the Board of Fish walks away with an understanding of how deep and sacred that relationship is, our relationship to the herring and to the waters and to the land,” said Brady. The Herring Rock Water Protectors, on leave from their jobs as social workers, educators and commercial fishermen, supported elders, community members and one another through the democratic process. They kept an eye on the public testimony list, made calls to alert people of their time slot, and shuttled people to Centennial Hall. They also testified, themselves, and, through audio recordings that echoed around the room, brought to the board the testimony of elders from the 1997 meeting — including Louise’s mother, sister and Marc Jacobs Jr. Some in the audience were moved to tears listening to the voices of elders since passed warning of the collapse of herring populations. For the next three days the Board of Fish listened to more than 200 finfish testimonies, roughly two thirds of them in reference to herring. During Jan. 23 deliberations, the board declined the proposals to reduce the sac-roe harvest. Though several board members said they found the testimony impactful, those voting against reducing the fishery said the data did not appear to support the measure. Also, they cited effects on those who make their living in the fishery. More information about the decision is on page 14 of this week’s issue. Regardless of the outcome, the Herring Rock Water Protectors have no plans to disassemble. Capital City Weekly editor Mary Catharine Martin contributed information on the board meeting to this story.